Alright, So Few days ago we discussed how to Solve Error Retrieving Information from Server Rpc s-7 aec-0 on Android device. 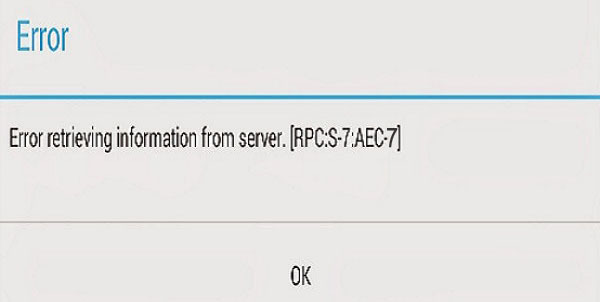 Today a similar error popped up on my cousins mobile while i tried to download an app from google play store.The error was Error Retrieving Information from Server rpc s-7 aec-7. I have seen people getting this very error on Bluestacks as well, Which is a popular Android Emulator. If you try and purchase any app in play store then also you are presented with the very same error. Both these errors looks very similar. But if you look closely you will notice there is a difference in Number this time. Its rpc s-7 aec-7 instead of aec-0 in the end. I tried downloading the same app couple of times and was shown the same error. So then i decided to follow the same Steps/methods which we discussed in the earlier post. And to my Surprise I was able to finally get rid of this new error with the same Procedure. I will just rehash the same Steps that i did to solve this error. Hopefully you will be able to get rid of it as well. Simply follow the below steps one by one. Step 1: Removing Google Account. You know it is necessary to add your google account to use Google play store,What we will do is we will first try and remove the account and see if the problem is solved. Goto Settings > Accounts > Select Google > Remove account/Delete account. This will delete your Play store account. Do not worry you can set it up again with the same credentials later on. But Right now jump to Step 2. Once you have removed your google account in step 1, Now let us clear the cache and data of Google play store and other google related apps. So Simply Goto Settings > Application Manager >All Tab > Google play Store > Clear Data and Cache. This will Clear the Cache from Google play store app. Do the Above Same steps to clear Cache from Google Service Framework, Google play Services and Download Manager too. After completing this step, Reboot your Phone. Ok so now you have deleted your gmail acount and cleared the caches from above mentioned apps. Now once you have restarted your phone, Add your gmail account again which you removed in Step 1. To add the account again, navigate to Settings > Accounts > Google > add Account > Enter your Credentials. Now see if you still getting the error. In most cases the error should be gone for good now. Update: I am reading the Feedbacks from People in Comments below and i can see many of you have struggled to solve this error with the above steps. Though the above steps have worked for some people. I will show you another way to Download your favorite app without getting rpc s-7 aec-7 server error, The trick here is to Download apk file for your required app on your PC. First Make sure you have checked "Unknown Sources" box which you can find in Settings > Security. Doing this will allow you to install apps from sources other than play store. Thing to note here is to be very Careful while downloading apk files, Use only the authority and trusted websites to download. To find apk file for your app, go to google and search for "yourappname.apk" in google. For example if i am looking for facebook app then i will search facebook.apk, Download the file in your PC. Now Transfer the file from your Computer to Mobile using USB cable. You might be having file explorer so use it and navigate to the apk file that you just transferred from your PC. Click on the file and you will see the option to install, Tap on it and you will be able to install the app without any error. Let me know in Comment box if you have any trouble and if these steps helps you to fix Error Retrieving Information from Server rpc s-7 aec-7 issue on your android device. "chek your conection and comeback"
i did this ten times and did factory reset five times still does the same thing. First step failed. I can only remove the account by doing a factory reset. Hi Nick Doddle, Thats Strange but did you tried simply clearing the cache and data of the apps mentioned above ? same for me. so i followed all the other steps, now i am getting "no connection, retry" inside the Play Store. Please make sure your Time and date is correctly set. I had a strange problem. Many of my google apps weren't (aren't) singing in to my account, so I cleared cache, data, removed account. Everything. Nothing worked, and then I uninstalled the play newsstand update and restored if to factory settings, oddly enough, the sign in problem was gone for some apps but THEN the Play store error started coming. From apkmirror I installed the latest newsstand version, clears the framework data, play services data, play store data, rebooted the device, but STILL the problem persists. What to do? This actually worked very well for thanks! Thanks Jaime, Your input might help someone. Omg!! I have tried everything but failed. What should I do now? Works not for me. Did everything several time. Thanks Mate!! It worked!! Cheers!! It's not really works. What should I do? once removing the account and clearing cache and then rebooting as mentioned in the above steps its working fine.. thanks a lot.. I just wanna thank you, it worked for me. Thanks lot guys, Its working on my MOTO-E 1st gen mobile .....! Now press force stop,clear cache and clear data. Launch it and it should work now. Worked for me. Thanks a bunch.